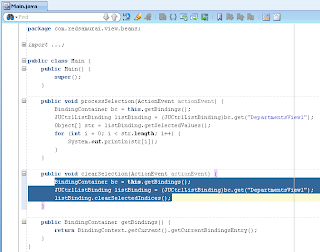 ADF Faces provides long list of rich UI components. 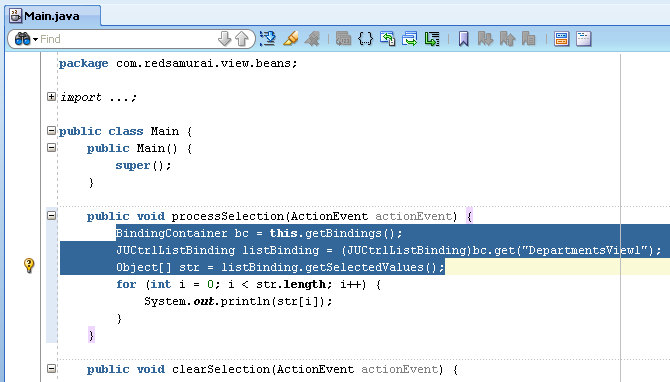 One of them shuttle component, it allows to create shuttle type multi-selection lists out of the box. We were looking how to access shuttled items programmatically, didn't found any proper info on the Web - decided to contribute to community with one more hint. 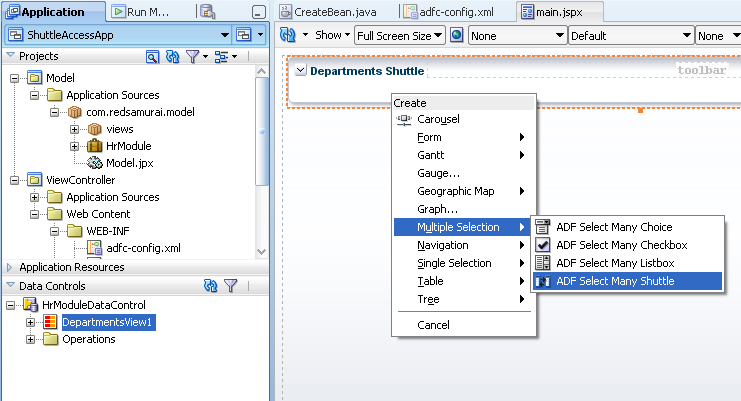 If you will read ADF Faces developer guide, there is a suggestion to use ADFShuttleUtils Java Script object in order to access shuttle items. This means you would need to implement af:clientListener for Java Script invocation and so on, but I'm not a big fan of using Java Script for such scenarios. Let's find easier and better solution. I Created a new components programatically and now i want make these components selectable to delete a specific one. Thank u for a wonderful post. i am using the vo based on an EO and i want to save the selected one in database...i tried doing it from AMImpl but it is not working can u suggest me something to achieve this. You can use sample app from this post, it should cover your use case. is it possible to initialize the component, with the previously added items selected ? 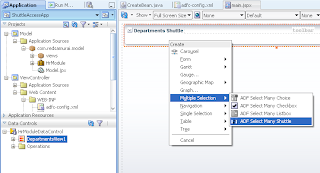 Yes, you will need to store selected values in database and then every time before rendering Shuttle, make sure to use setSelected(key) to prepare selected values. Thanks for your post but I still need help. I have a selectManyShuttle which is getting value programatically. 1: Selected few values from available. 2: Created one more value and added into available list (It happens in a popup). 3: After I close the popup, newly created value is added into available items but selected items are getting disappeared. 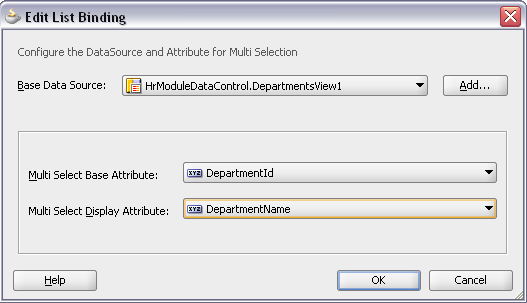 4: Here I want to keep the selected values as selected even after adding a new item. Any idea how can I do it? 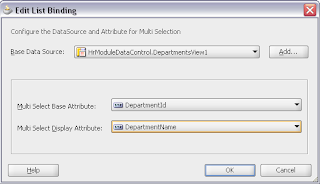 If its more complex requirement, you may implement as two regular tables. Can we keep the selected values as selected after the refresh of selectManyShuttle. This refresh will add one more value in available values. Can we use a tree component in he shuttle component. My requirement is to show the item from left pane to move to right pane under a certain value, something like a tree. I have a use case to ask and hopefully you can find time to lead me in the right direction. In this particular blog you are retrieving the value of the component binded like the one below. Is there any utility class to do such as the code below that when executed would set the value of my LOV components? 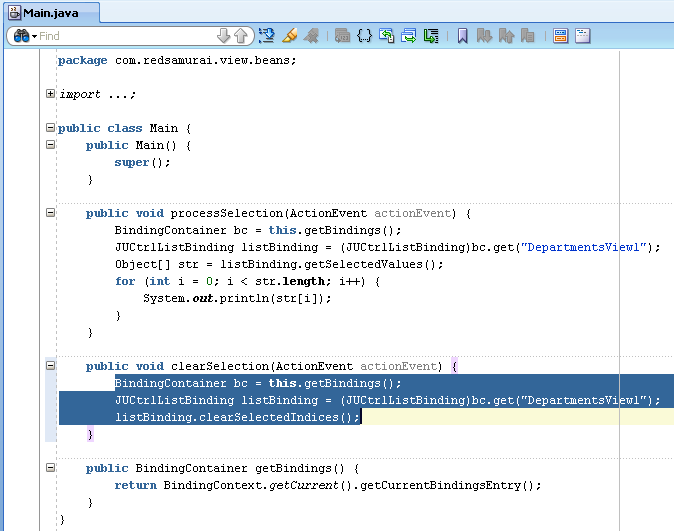 with listbinding. Then how do you accomplish this? I am a big fan of your post and everyday at work I always see to it to check if you have a new post so keep on blogging please. please advice if you can. If I select some rows in shuttle then click the delete button. I have a task flow , and there are 3 pages .. i have 2 selectMany controls and i want to access the selections from the third page , i dont want the user to click any buttons apart from making the selections and clicking the next button to go to navigate to the next page. How do we get both the base and display attribute value in the bean. I have a use case in which i have to display both base and display attributes. We tried implementing the same but we are facing issue on page load where pre- populated selected values are not visible. We tried printing the list in managed bean same list is printed properly der.